Capture superb low-light shots with a Large MOS Sensor and Built-in LED Light, while maintaining stability with a shoulder-mount design. Pro-level functions, such as a Dual SD Card Slot & Manual Ring, also enhance your video recording performance. 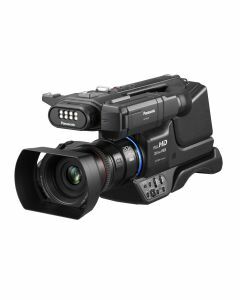 The Panasonic HC-MDH3 is a shoulder-style Full-HD camcorder with Built-in LED Light and Large, 1/3.1-inch (type) MOS Sensor for beautiful low-light shooting. It also achieves the high picture quality and easy operation that are required by professionals thanks to its 20x zoom lens, Picture Tone, and Dual SD Card Slot. The combination of a Large, 1/3.1-inch (type) MOS Sensor and Bright, Optical 20x F1.8 Lens renders beautiful images even in dim lighting. Shooting in dark places is also enhanced by a bright LED Light (300 lx at 1 m). And the HC-MDH3 comes equipped with a diffusion filter that softens the light source. The shoulder-style design lets the user maintain a stable posture even when shooting for long periods of time, and enables easy operation of a host of professional functions. The Multi-Function Manual Ring allows switching of zoom, focus and iris for quick, delicate control, and the Illuminating LED Ring feature shows at a glance whether the HC-MDH3 is recording or not. The Intelligent AF System provides quick and accurate focusing. User Buttons also enhance operating ease, along with a variety of Focus Assist Functions. These and other functions meet the many needs that professionals face in shooting on-location. Two picture quality settings "Standard and Sharp" are preset for easy switching of colour and other tones as desired. When the Sharp setting is chosen instead of Standard, Gamma is compensated with high contrast, the Colour Matrix is made more vibrant, and Sharpness is applied to enhance clarity for vivid images. When the card in Slot 1 becomes full, the camcorder automatically continues to record onto the card in Slot 2. In addition, Hot Swap Recording lets the user exchange cards while shooting. By sequentially exchanging recorded cards with blank ones, the HC-MDH3 achieves endless recording to capture extended events. * Safe, secure, Simultaneous Recording is also featured to record the same data onto the cards in both slots. * The file is divided every 10 hours.